The above info came from Alessa Grande, and was edited by yours truly (contact me). 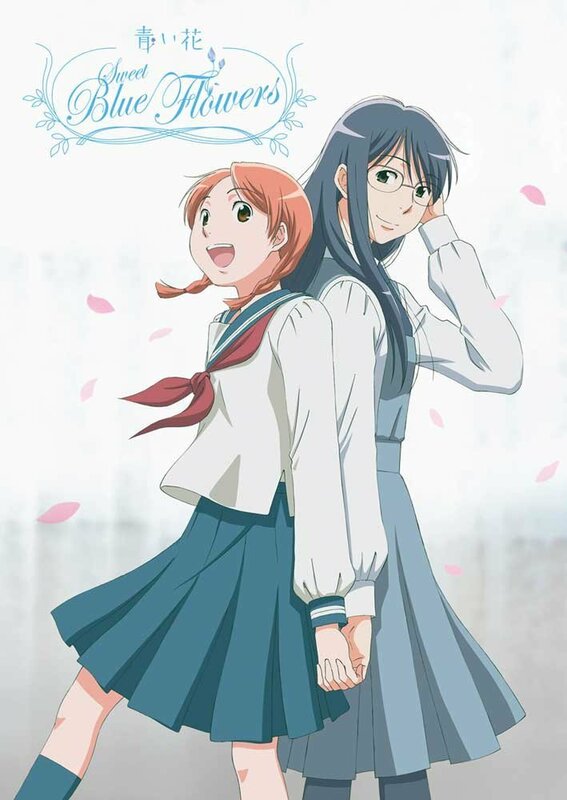 At the start of Sweet Blue Flowers, Akira Okudaira, who is an entering high school student into Fujigaya Girls Academy, becomes reacquainted with her childhood friend Fumi Manjōme whom she has not seen for ten years. Fumi is attending Matsuoka Girl's High School where she quickly becomes friends with a handsome third-year student named Yasuko Sugimoto. Akira joins her school's drama club with her friend and classmate Kyōko Ikumi, who is in love with Yasuko, though Yasuko turns her down. Akira meets Kyōko's fiance (in name only) Kō Sawanoi. Yasuko and Fumi become a couple, and Fumi comes out to Akira who is at first unsure on how to act, but still tries to support Fumi's new relationship. Akira's drama club does an adaptation of Wuthering Heights for a drama festival; Fumi helps out with her friends Yōko Honatsugi, Misako Yasuda, and Miwa Motegi. Yasuko breaks up with Fumi, who learns that Yasuko's older sister Kazusa is marrying a teacher at Fujigaya named Masanori Kagami whom Yasuko had fallen in love with. Time passes after the wedding, and Yasuko decides to study abroad in London after graduating. Miwa and Akira's older brother Shinobu start going out, and Fumi tells Akira that she was her first love, much to Akira's embarrassment. When Akira and her friends enter their second year of high school, an energetic first-year student named Haruka Ōno joins the Fujigaya drama club. Akira and Kyōko are split into different classrooms, and Akira meets a tall girl in her new class named Ryōko Ueda. The high school division of Fujigaya does the play Rokumeikan with Akira, Kyōko and Ryōko playing lead roles, though Ryōko only agrees to act because Akira also agrees to act alongside her. Fumi and Haruka become friends, and Haruka confides in Fumi that she suspects her older sister Orie may like women. Not knowing how to respond, Fumi seeks advice from Akira, but ends up confessing her love for her instead. Kyōko does not want Kō to break off the engagement, but he ends up finally breaking up with her. The play goes well and everyone praises the actress' performances. Over summer vacation, Akira suggests to Fumi that they go out together after thinking deeply about it.